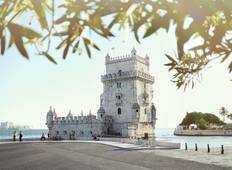 Find the right tour for you through Cascais. We've got 14 tours going to Cascais, starting from just 3 days in length, and the longest tour is 19 days. The most popular month to go is May, which has the most number of tour departures. "Fantastic tour! I don't recall the names of my tour guides, but they were all outstanding,..."
"The tours were good but did not always complete what was in the brochure. Aveiro..."
"Excellent tour guide and driver. Tiago, I would suggest to add time for a museum..."
"Great tour, Dan was an excellent tour guide, wonderful group, lots of fun had by..."
"Wonderful overview of Portugal!! We saw quite a few special sites and enjoyed the..."
"Everything was all good, nice excellent Organized, hotels ,guide was perfect. Only..."
"Itinerary was great. Really saw a lot of Portugal."